Becoming the parents of quintuplets takes some getting used to. Jeanette and Arthur Fardelin have had longer than most. 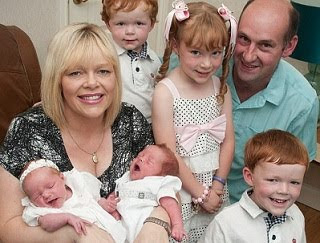 Their fabulous five – all conceived through IVF on the same day – were born six years apart. The children, all sharing the same auburn hair and blue eyes, have fulfilled the couple's dream of a large happy family. And they have staggered their arrivals beautifully. Millie was the first in 2006, while Adam, now four, came along two years later. They were followed by Matthew, now two, and last month twins Isaac and Lulu were born. Experts say they know of no other case where five siblings have been born at different times from the same round of fertility treatment. -- The ultimate compendium of pre-pregnancy advice, essential not only for the one in six couples struggling with fertility challenges, but also for anyone starting a family. This chunky volume offers hundreds of ways, sourced from doctors and the latest research by the experts at Conceive Magazine, for women to conceive faster. Each page offers a new and often surprising tip: women should avoid taking ibuprofen, while men looking to increase sperm count should double up on pumpkin seeds! With this highly accessible reference in hand, readers will be one step closer to parenthood. -- Start reading Fertility Facts on your Kindle in under a minute!